GRAND BOULEVARD 52 • SHOPPING CENTER BUSINESS • August 2018 to richly landscaped walkways and tree-shaded gathering spaces, How- ard Group has invested significant re- sources in making, and keeping, the meticulously landscaped town center a visual and experiential standout. In a region where natural beauty is abundant — the 1,600-acre Top- sail State Preserve State Park with its 3.2-mile shoreline is across the street from Grand Boulevard — it is fitting that green space is so prominently featured in the project's design. The large public Grand Park is an outdoor space where entertainment, commu- nity celebrations and special events are held year-round. Grand Boule- vard's cultural arts program attracts tens of thousands of people a year to the festivals and unique events in its popular Coastal Culture Calendar which includes events like Artsquest Fine Art Festival, Theatre Thursdays, Ballet at Twilight, Barktoberfest, Grand Boulevard Farmers' Market, 30-A Songwriter's Festival and the acclaimed South Walton Beaches Wine & Food Festival. All of Grand Boulevard's events have strong char- itable components benefiting local civic and non-profit organizations. 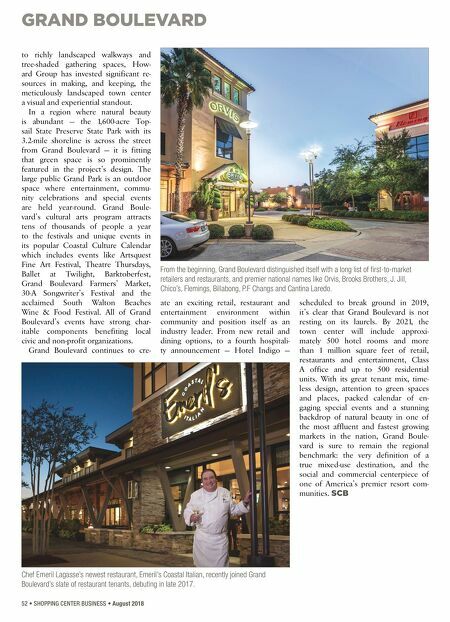 Grand Boulevard continues to cre- ate an exciting retail, restaurant and entertainment environment within community and position itself as an industry leader. From new retail and dining options, to a fourth hospitali- ty announcement — Hotel Indigo — scheduled to break ground in 2019, it's clear that Grand Boulevard is not resting on its laurels. 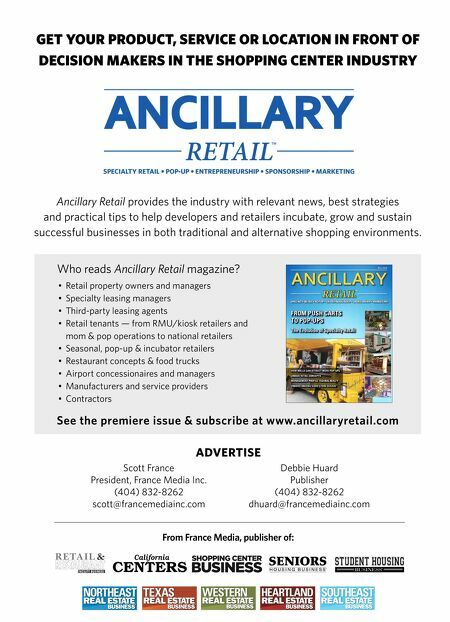 By 2021, the town center will include approxi- mately 500 hotel rooms and more than 1 million square feet of retail, restaurants and entertainment, Class A office and up to 500 residential units. With its great tenant mix, time- less design, attention to green spaces and places, packed calendar of en- gaging special events and a stunning backdrop of natural beauty in one of the most affluent and fastest growing markets in the nation, Grand Boule- vard is sure to remain the regional benchmark: the very definition of a true mixed-use destination, and the social and commercial centerpiece of one of America's premier resort com- munities. SCB From the beginning, Grand Boulevard distinguished itself with a long list of first-to-market retailers and restaurants, and premier national names like Orvis, Brooks Brothers, J. Jill, Chico's, Flemings, Billabong, P.F Changs and Cantina Laredo. Chef Emeril Lagasse's newest restaurant, Emeril's Coastal Italian, recently joined Grand Boulevard's slate of restaurant tenants, debuting in late 2017.